Your gratitude for someone can be on display in a beautiful garden. 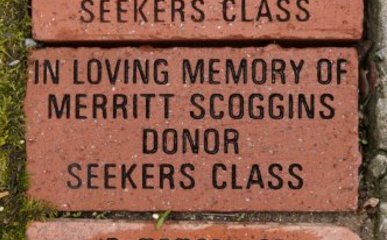 For a $250 donation to Southwest Christian Care, you can give a lasting tribute in memory of or in honor of someone special. Or celebrate a graduation, a birth, or an anniversary. The unique garden on the Southwest Christian Care grounds offers healing and hope for both patients and family members coping with the stress and exhaustion related to terminal illness. Bricks can have 4 lines of text, each line can contain 19 characters with each space counting as a character.